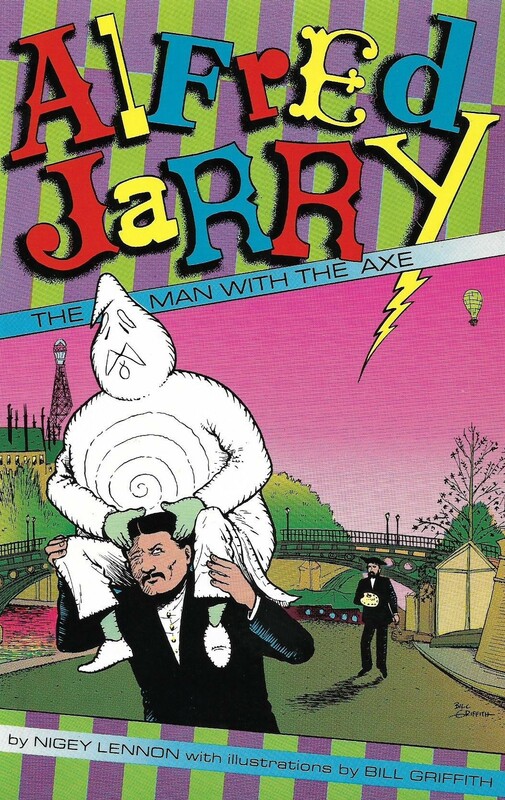 Nigey Lennon, Alfred Jarry: The Man With The Axe, illustrations by Bill Griffith (Los Angeles: Panjandrum Books), 130 pp., 43 black and white illustrations. This sprightly reclamation job on a punk ancestor, adding little to Roger Shattuck’s Banquet Years (1968) chapters, is most vital in Lennon’s account of how her teenage discovery of the ultimate monstre sacré ruined her character and saved her life. Griffith’s many drawings are a delight (it’s no accident that his Zippy the Pinhead is a ringer for Jarry’s woodcuts of Père Ubu), but the inclusion of his blazing collage-bio “The Life of Alfred Jarry and Relevant Data” (1982, Raw magazine #4) would have made a perfect companion to Lennon’s closer, a swift piece of fiction that sees Jarry elected mayor of Los Angeles. All in all, a good time. This entry was posted in Book Reviews and tagged Alfred Jarry, Artforum, Bill Griffith, Greil Marcus, Nigey Lennon. Bookmark the permalink.